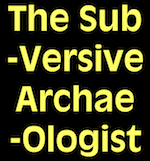 The Subversive Archaeologist: Drowning....Not Waving!!! I've been paddling madly, but the current just keeps pushing me further downstream. I received my new desktop the other day, and I completely stuffed up the 'migration.' I'm very lucky that it wasn't a complete catastrophe. As it is, I painted myself into several corners at once, and although I'd been backing up like crazy, in the end I had to do a 'reset to factory settings' without a complete backup. I had some lucky stars shining on me, it seems... my emails were almost entirely backed up on my ISP's server. I think that all I've lost are my browser bookmarks. Phew! But it's taken days, and heaps of my mental and emotional energy, to get to a point where I might be able to go on as if nothing had happened. Sorry. I've been very busy over the past week or so--but not keeping up with the blog. There should be something emanating in the next 24 or 36 hours. So many crazy archaeological inferences; so little time.